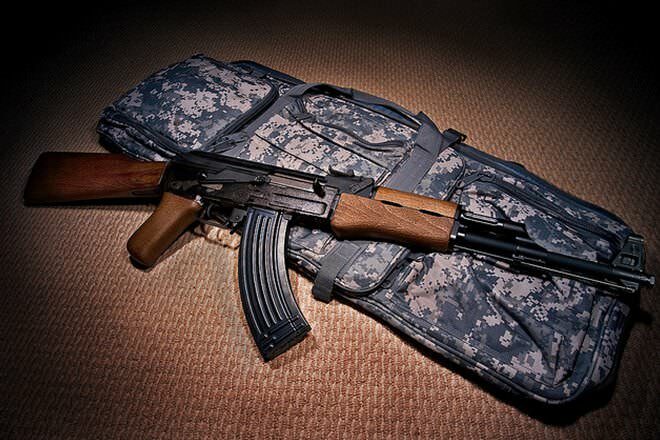 The AK-47 and the M16 are two of the most widely used assault rifles in the world. Both gained popularity and fame for being the standard issue assault rifles used respectively by the Soviet and U.S. militaries during the Cold War. Their ubiquitous deployment today by military, police, security forces, revolutionaries, terrorists, criminals, and civilians alike make them the frequent subject of comparison. The AK-47 is a selective-fire, gas-operated assault rifle, first developed in the Soviet Union by Mikhail Kalashnikov. Officially known as Avtomat Kalashnikova, it's also called Kalashnikov, AK, or in Russian slang, Kalash. The M16 (officially Rifle, Caliber 5.56 mm, M16) is the United States military designation for the AR-15 rifle adapted for both semi-automatic and full-automatic fire. Colt purchased the rights to the AR-15 from ArmaLite. The Soviets developed the AK-47 shortly after World War II. It was designed with emphasis on firepower, ease of use, low production costs, and reliability in keeping with the Soviet army’s doctrines of mobile warfare. By the early 1950s, it had entered widespread service throughout the Red Army. After World War II, the U.S. Army initially focused its firearms development on semi-automatic rifles, which resulted in the M14. By the Vietnam War, during which the AK-47 and M14 were pitted against one another, deficiencies in control and fire superiority led to the need for a replacement for the M14 that, through a series of refinements, eventually resulted in the M16. The AK-47 is a select-fire, magazine-fed rifle compatible with 7.62x39mm cartridges. It is air-cooled and long-stroke-piston gas-operated with a rotating bolt. Designed to be a simple, reliable automatic rifle that could be manufactured quickly and cheaply, it utilized mass production methods that were state of the art in the Soviet Union during the late 1940s. By contrast, the M16 is a select-fire, magazine-fed rifle compatible with 5.56x45mm cartridges. It is air-cooled and direct impingement gas-operated, with a rotating bolt and straight-line recoil design. It was designed primarily as a lightweight assault rifle, and to fire a new lightweight, high velocity small caliber cartridge to enable users to carry more ammunition. The 7.62x39mm cartridge lends the AK-47 more weight and greater penetration when compared to the M16. Differences between AK-47s using forged or milled receivers and stamped receivers lend forged or milled variants better accuracy, while AK-47s using stamped receivers tend to be more resistant to metal fatigue. The 5.56x45mm cartridge gives the M16 better range and accuracy when compared to the AK-47. Its minimal recoil, high velocity, and flat trajectory allow shooters greater precision than the AK-47. The AK-47 has a barrel length of 415 mm, while the M16 has a standard barrel length of 508 mm. The AK-47 is a gas-operated, rotating bolt (Long Stroke Gas Piston) rifle. The M16 is a direct impingement or a rotating bolt rifle. As the M16’s magazine was designed to be more lightweight and less durable, it is made of pressed/stamped aluminum, and its feed lips are weaker than the AK-47’s as a result. Ranging between 3.26 and 4.0kg, the M16 is lighter than the 4.3kg AK-47. The M16's safety (selector) switch is easily manipulated without losing sight picture. Its smaller size makes it more difficult to use under stress. The M16 is unfriendly to left handed users both in terms of controls and in terms of shell ejection. The AK-47 is renowned for its ruggedness and reliability. It has a malfunction rate of one out of 1000 rounds fired and is designed in a way that even untrained individuals can use it. It is also built with generous clearances, which enable it to function in dirty environments with minimal maintenance. These clearances enhance AK's reliability at the cost of accuracy. With an early reputation for poorer reliability, the M16 has roughly twice the malfunction rate as the AK-47, at two rounds per 2000 fired. The M16’s design requires copious and frequent use of compatible lubricants on its receiver, and lack of lubrication is the most common cause of stoppages or jams. Newer iterations of the M16 have been improved to increase service interval times. The Soviet Union did not control the production of the AK-47 with copyright law or patents. As such, the AK-47 is manufactured in many countries, by many manufacturers, to varying degrees of quality. Because of this, the AK-47's service life can range between approximately 6,000 to 15,000 rounds. Designed as a simple, inexpensive, and easy-to-manufacture weapon, it is often easier to replace than to repair. 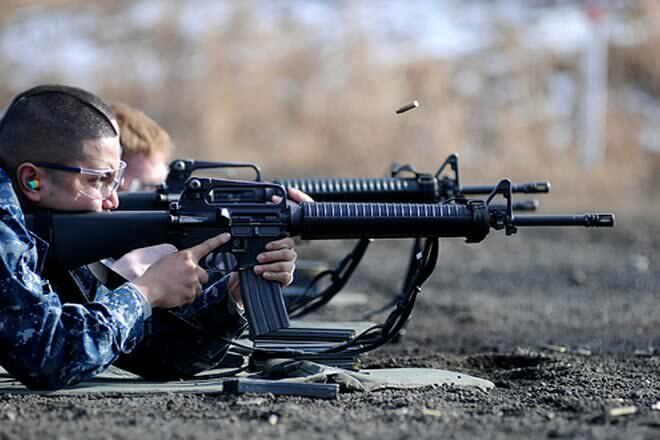 The M16, on the other hand, is manufactured to high standards that allow for a service life of up to 20,000 to 50,000 rounds for cold hammer forged barrels. Unlike the AK-47, the M16 was designed for servicing, and lends itself to field maintenance and repairs. For both the AK-47 and M16, smaller parts require replacement every few thousand rounds fired. Although many variants are available for both the rifles, when comparing the base models, the AK-47 is significantly cheaper than M16. The government price of the AK-47 can range from $150 to $200, depending on manufacturer and contract. The government price of the M16 was $673 per a new unit as of the U.S. Army’s 2012 contract. A failure rate of 2:2000 is the same as 1:1000.... Check your math. One error in comparison: The AR-15 rifle is capable of SEMI-automatic fire ONLY. The M-16 is capable of select fire, i.e., firing in either semi-automatic or fully automatic mode, i.e., as a "machine gun." Very important difference!! @Timothy Chong I never said I couldn't hit anything with it. And no, I do not clearly lack training. Not sure where you pulled that one. Is an AK accurate enough? Sure. I quite like them actually. I was simply trying to prove a point by going to extremes. Personally, I am only interested in accurate guns. That does not mean I am saying I am not interested in AKs.